In the United Kingdom, renewable fuels company, Velocys, received a “notice to proceed” action to commence manufacturing of the Fischer-Tropsch reactors and catalyst for the Red Rock Biofuels biorefinery that will be located in Lakeview, Oregon. RRB has commenced construction of the biorefinery, which will incorporate Velocys’ technology, and produce low- carbon, renewable diesel and jet fuel. Velocys’ role will be as a licensor for its technology to the project. Red Rock’s construction is estimated to take 18 months, with operations planned to start in 2020. RRB is a subsidiary of IR1 Group LLC, which has 325 million gallons of installed biofuels capacity. By using forest and sawmill residues, RRB’s biorefinery will not only avoid competition for agricultural resources, but also reduce the risk of catastrophic wildfires by removing waste biomass from overgrown forests. It will also help to regenerate the local forestry industry. Check out Red Rock’s technology here: Jet and diesel from the sticks: The Digest’s 2017 Multi-Slide Guide to Red Rock Biofuels. The biorefinery in Lakeview will convert about 136,000 tons of woody biomass and forestry residue into 15 million gallons per year of renewable transportation fuels including diesel and jet fuel. Enough jet fuel will be produced by the plant to fuel 1,800 round trips per year from Portland, Oregon to San Francisco. RRB has in place contracts from several airlines to purchase 100 percent of the jet fuel produced each year. Mitch Jackson, Vice President of Environmental Affairs and Chief Sustainability Officer at FedEx recently shared that one of FedEx’s goals is to obtain 30% of jet fuel from alternative sources by 2030 with Red Rock providing several million gallons of fuel annually for a period of years. “We have been working with select companies on alternative sources of fuel so we can start using it,” Jackson told Environmental Leader. As reported in the Digest in January 2018, RRB has eight-year offtake agreements for 100% of the jet fuel with Southwest Airlines and FedEx. Diesel and naphtha output will be sold through the either future offtake agreements with major refiners or on the spot market. Red Rock became the third back in January to get a greenlight through government-backed bonds to help push an advanced technology through to commercial scale. As reported in the Digest in September 2017, British Airways is jumping back into the MSW-to-aviation biofuel game with a new partnership with Velocys. The project’s aim is to use hundreds of thousands of metric tons of household waste including diapers and plastic food containers to produce enough fuel to power all of BA’s 787 Dreamliner flights from London to San Jose, California and New Orleans. RRB’s Lakeview project is expected to deliver around $15 million revenues to Velocys during the construction and early operation stages of the plant, and an additional $30 million or more over the life of the biorefinery. Over $6 million has already been invoiced and received from RRB. With broad international agreement in the aviation industry for carbon-free growth beyond 2020, airlines are actively seeking low-carbon jet fuel to reduce their greenhouse gas emissions. The civil aviation industry alone will require around 1.5 billion gallons per year of new renewable jet fuel production capacity to meet this commitment. Velocys’ technology, be it via licensed third-party projects like RRB’s biorefinery, or through Velocys’ own projects such as the Natchez, Mississippi project, will supply the aviation and road haulage industries with a scalable, sustainable supply of fuel, according to their press release. Velocys signed an option on 100 acres near Natchez to develop a wood-based advanced biofuel facility that could also be upgraded to aviation biofuel. As reported in the Digest in October 2017, they plan to invest hundreds of millions of dollars, so local authorities are lining up to offer it $42 million in county tax breaks, up to $15 million in state tax breaks, as well as $5 million worth of land and infrastructure upgrades from the county and local utility. 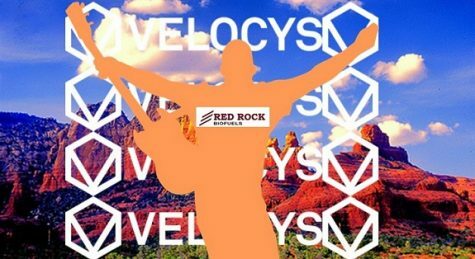 There are so many interesting pieces to this project making us keep an eye on it – from Red Rock’s connections and offtakes with airlines and FedEx, to the technologies involved with Velocys and Red Rock, to the money, estimated revenues, and bond financing. It just seems like the stars are aligning on this one which makes it a pretty exciting project to follow.